The last week of July saw the hottest days of 2015 driving electricity demand to it's highest levels in 18 months. Market data for the month, coupled with the newest estimate of the month's global adjustment costs, indicate a fourth consecutive month of 20+% increases over 2014's electricity commodity pricing. A mainstream media site, the Toronto Sun, posted an editorial titled Wynne's hydro policy is insane. The editorial picked up on some of the poor decisions causing rising pricing but contains some data errors. These errors are understandable given the inability of Ontario's system operator, the IESO, to update its methods of accounting for electricity generation, and costs, since absorbing the Ontario Power Authority at the start of 2015. Not only has reporting not advanced, the IESO displays declining competence in producing the reports it historically has. I'll use the highlighted elements of the Sun's editorial to demonstrate the IESO's growing inability to report on supply and demand in Ontario's electricity sector. To understand the mess Ontario’s Liberal government has made of the hydro file, one only needs to look at how electricity was produced in our province on Wednesday [July 29], the hottest day of the year to date. At 4 p.m., there were 21,863 MW (megawatts) of electricity being generated. Of that, 10,761 MW, or 49%, was being supplied by nuclear power; 5,296 MW or 24% by hydro and 4,715 MW, or 22%, by natural gas. They were generating 4.7% of Ontario’s electricity supply: 925 MW, or 4% for wind; 72 MW, or 0.3% for solar; 94 MW, or 0.4%, for biofuels. The 21,683 is from the IESO's Generators Output and Capability report for hour 16, but that is not a complete picture of generation in the province. Hour 16 is the average generation between 4 and 5 pm. The Output and capability report shows a portion of generators, those "generating facilities in the IESO-administered energy market with a maximum output capability of 20 MW or more." Smaller generators in that market bring the total up 411 megawatt-hours (MWh) to 22,274 MWh - the larger number being referenced by the IESO as "Ontario Demand" or "Energy Demand." The IESO's reporting of "demand" is increasingly outdated, as it actually refers to demand for supply from transmission (Tx) connected generators. Increasingly generators are "embedded" in local distribution (Dx) sectors. The IESO has improved on an old OPA quarterly progress reporting format with a report for the 1st quarter of 2015 indicating 2603.8 MW of contacted capacity in commercial operation, of which the majority, 1634.1 MW, was solar. Actual solar production during 4-5 pm on July 29th could have been 18 times greater than the 72 MW the Sun reported for solar. 72 MW is the output of the only location reported hourly by the IESO, the Grand Renewable Solar Facility (GRANDSF). The IESO doesn't consider the site as having reached commercial operation so they still show Tx connected solar capacity at 40 MW even while showing generation for GrandSF as high as 99 MW. Apparently this makes sense within the IESO. With such poor reporting the 1 out of every 20 businesses the Chamber of Commerce suspects may shut have no visibility of the cost drivers behind the commodity rate increases that are now repeatedly exceeding 20% (from the same month in the previous year). The Sun's editorial, using the only coherent generation data available for the hour available from the IESO, reported wind and solar producing 4.3% during that one hour, but my estimates including distribution connected resources is ~8%. I estimate that 8% of generation was 30% of total hourly supply costs - excluding spending on negawatts. 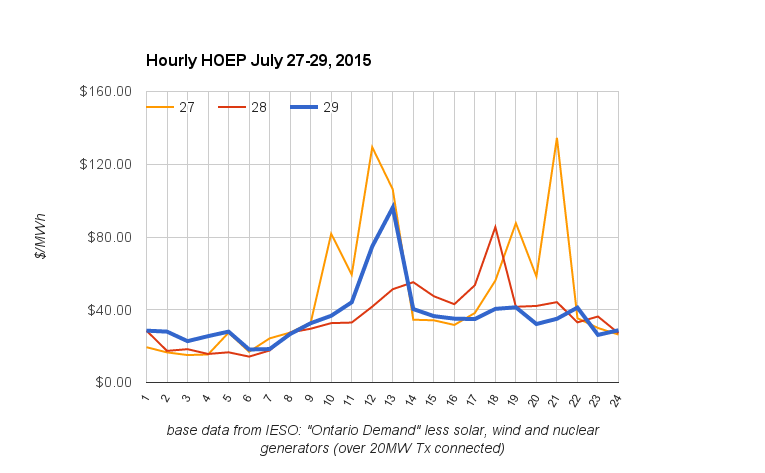 The last week of July, with its heat, increased concerns the IESO simply doesn't have much competence in operating a market or managing the growing fleet of renewables. 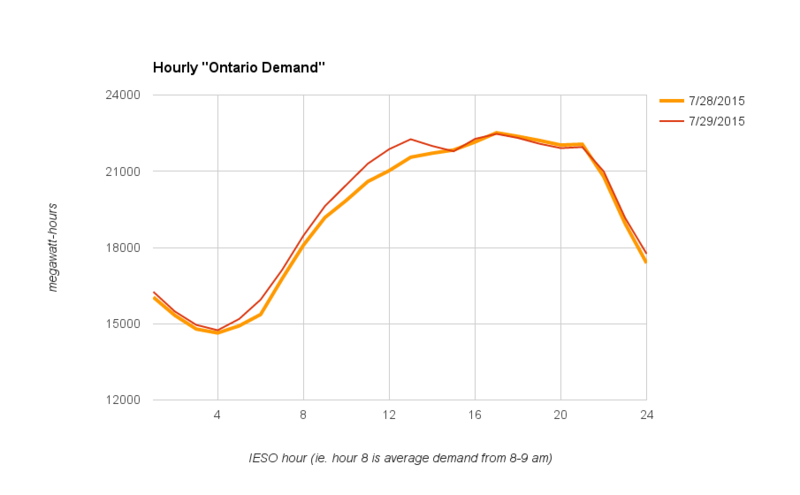 While the Sun's editorial understandably focused on the hottest afternoon, the IESO reported hourly "Ontario Demand" peaked in hour 17 of the previous day. Apparent in the graphing is the activation of the PeakSaver program from 2-6 pm on the 29th (market hours 14-17). Having paid to install fancy thermostats in expensive homes with central air conditioning it's understandable the IESO be excited to implement the program for province's most affluent, but doing so harms what remains of a market mechanism. The HOEP (Hourly Ontario Energy Price) was $96.19/MWh prior to the Peaksaver activation, which is about $65/MWh less than Ontario's Regulated Price Plan customers pay on a weekday afternoon. In a market, high prices could motivate new suppliers, so taking action to avoid even moderate pricing by introducing demand response programs is problematic whether or not the program has already been paid for. Activating Peaksaver the afternoon of the 29th indicates the IESO doesn't understand their market very well. The demand on dispatchable generators is not set by demand for supply but by demand for supply less all the supply Ontario has committed to purchasing regardless of demand. 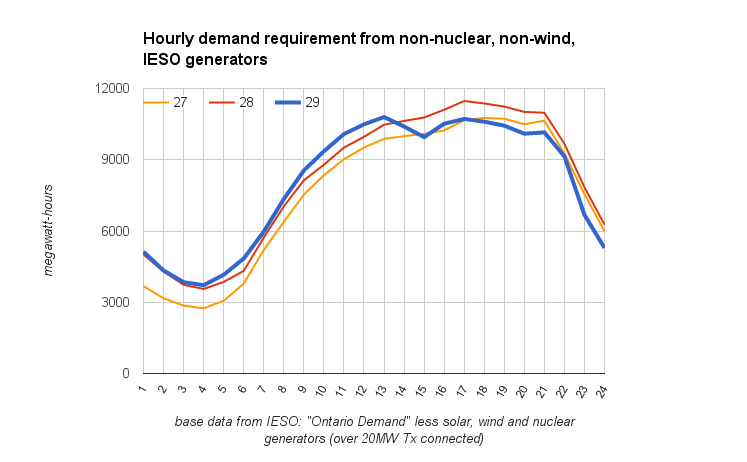 I can show the relationship during the 3 weekdays of high heat by subtracting reported supply from nuclear, wind and the Grand solar farm from the IESO's "Ontario Demand". The requirements for supply from the Tx generators was higher on the 29th than the previous 2 days prior to the PeakSaver demand response action, but not by much. With wind rising both actual demand and requirements for supply from non-wind generators were dropping regardless. The combination of rising wind and activation of the Peaksaver program likely contributed to a drop in the market price the afternoon of the 29th, but not as much as the Class A global adjustment methodology did. I recently wrote on the topic, which sets global adjustment charges for the province's largest consumers based on their share of the 5 highest daily demand hours during a 12-month period, but perhaps Professor Anindya Sen provides a simpler reference in the recent Peak Power Problems: How Ontario’s Industrial Electricity Pricing System Impacts Consumers. Sen calculated "the cost of consuming electricity during a single High-5 hour [as] roughly $52,337/MWh" for class A consumers. That calculation was based on a period when the total global adjustment was about 2/3rds of what it is today, so consumption of one megawatt-hour during the 3-day hot spell would be expected to effectively cost a Class A consumer closer to $80,000. The hour 14 rate drop on the 29th, coincident with the activation of the PeakSaver demand reduction tool, was less acute than the drop on the 27th. A main driver of both was the High 5 mechanism of the class A global adjustment. I will note that the highest price during this 3-day hot stretch came in hour 21 (9-10 pm) of the 27th. 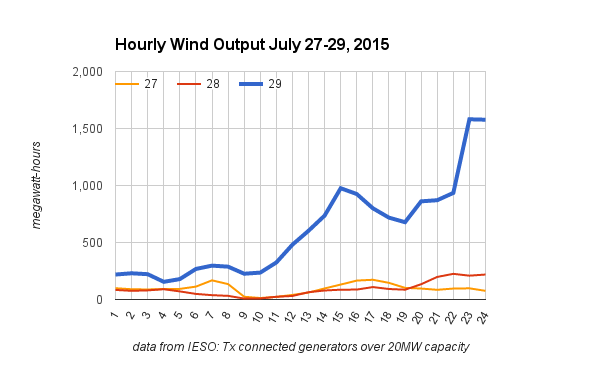 During that hour nearly 6000 megawatts of contracted wind and solar capacity produced less than 100 megawatts. Emphasizing the pricing is not dependent solely, or even primarily, on demand, the highest hourly market prices of the summer came on the Sunday following the hot spell. 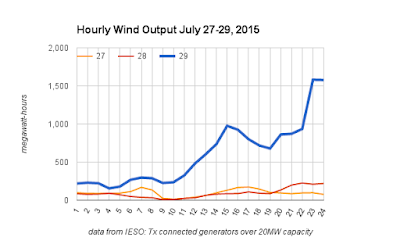 The wind was high during the moderate demand period, but turbines still far less productive than the IESO had forecast. A system status report noted, "The variable generation forecast has changed by 500 MW or more in at least 2 hours..."
The week demonstrates an aspect of luck in hitting the "high 5" coincident peak (5CP) hours determining the global adjustment's enormous shifting of sector costs to smaller consumers. Last adjustment period (which run May-April) the IESO was reporting the highest five hours included January 7's hour 18 and February 23rd's 19, but when the IESO showed the final high 5 hours, the hours were one hour later for these dates. The regulations setting the actual figure don't use the IESO's "Ontario Demand" but an "Allocated Quantity of Energy Withdrawn" (AQEW) calculation. AQEW figures aren't purblicly available for the hours not shared by the IESO, so there's no way of verifying the IESO's eventual claim that they are correctly identfying the top 5 - and I am skeptical they got it right the past period. If you are managing the energy costs for a "Class A" consumer, you'd have reason to be anxious about what hours from July end up as 5CP hours. On February 23, 2015 "Ontario Demand" in hour 19 was 165 megawatt-hours (MWh) greater than in the eventual "high 5" hour 20 that followed. On the 29th hour 17 reported the highest "Ontario Demand, but hours 16 and 18 were within 200 MWh of the total, and hour 13 was only 211 MWh off. It would be fascinating if the IESO's needless activation of the PeakSaver program moves the 5 CP peak from the now normal hour 17 to hour 13. The Ontario Chamber of Commerce's Empowering Ontario was released on June 9th and broadly reported on. The level-headed report carries, as it's number one recommendation, "Increase transparency of electricity pricing and system cost drivers." The IESO's has responded by delaying the release of its June report indefinitely (my version of a monthly report has been posted for weeks and is within a week of being worked on to reflect July's figures). The IESO's attitude toward a surprise change to two of the high 5 hours for the previous period, in May, seemed to be indifference. There remains no transparency on AQEW figures, and the IESO seems to believe they can maintain credibility without transparency. ... we have to pay wind producers first for their power (under 20-year contracts), even though we don’t need it because Ontario has an energy surplus. That was caused by the decimation of Ontario’s manufacturing sector due in part to high hydro prices, caused in part by the billions of dollars the Liberals wasted on wind. And yet Wynne is doubling down on this disaster, bringing more and more wind power online over the furious objections of rural municipalities, that we do not need and which is not doing the environment any good. Simply put, this is insane public policy. Utterly insane. I agree with the gist of their conclusion, but the editorial got some figures wrong. Considering the lack of transparency in reporting generation, that couldn't be avoided. Simply put this is insane public administration.